Warwick University is bidding to become the first UK university to set up a campus in the United States. It has entered a global competition to open a science campus in New York - competing against leading universities from the US, Europe and Asia. New York's mayor, Michael Bloomberg, said that creating the science campus would be a "game-changer" for the city's economy. 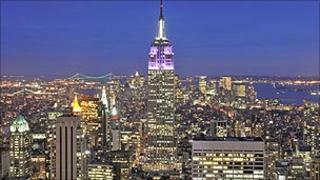 New York wants a research base to strengthen its technology industries. Warwick is up against 17 other bids to open a science and engineering research campus - which would help New York compete with US research powerhouses in California and Boston. In the wake of the financial crisis, there were concerns in New York that the city's economy was over-reliant on banking and finance and the science campus is intended to help diversify into hi-tech digital industries. Online businesses such as Google and Facebook grew out of university campuses and New York now wants to turn itself into the kind of "tech hub" that will generate such industries. "Many of the world's leading tech companies grew out of top applied science programmes, and we want the next generation of companies and jobs to start up here in New York," said deputy mayor, Robert Steel. The New York City Economic Development Corporation, which is running the project, has identified a number of possible locations for the campus. The next stage of short-listing is expected in the next couple of months - and the winning bid will be announced by the end of the year. Globalisation in higher education has often meant US universities exporting themselves overseas - but in this case New York is seeking to import a world-leading institution. Among Warwick's rivals is Stanford University, which has been at the centre of the digital economy in Silicon Valley in California. This west coast institution, rather than looking overseas, is now bidding to expand to the US east coast. There are other formidable US universities competing with Warwick, including Carnegie Mellon, Cornell, Columbia, New York University and Chicago. There are also bids from universities in Finland, Switzerland, India, South Korea and Israel. UK universities have been developing campuses overseas, such as Nottingham in China. There have also been many partnerships between UK and US universities - and a forthcoming shake-up of UK higher education could make it easier for overseas universities to set up in the UK. But, according to the Higher Education Statistics Agency, there has not been a campus set up by a UK university in the US. Warwick's vice-chancellor, Nigel Thrift, said that New York's need for a science campus "plays well to our particular strengths". "A significant element of our success comes from close partnerships with business and industry. We believe we can add value to this initiative through our experience in delivering strong successful applied science partnerships that bring together industry and academic researchers. "We are delighted that Warwick is being considered, alongside strong bids from leading US universities, for such an exciting opportunity," said Professor Thrift. Warwick will be able to point to strengths such as working closely with manufacturing companies, such as India's Tata Motors. The proposals for New York's new campus is part of a wider pattern of internationalisation. Higher education officials from the US and India are set to meet in June to discuss closer links. India, which has become one of the world's biggest university systems, is considering plans to open up to overseas universities. Yale University has also announced it is to set up a liberal arts college in Singapore with the National University of Singapore.